Italian bread to round out this scrumptious Italian meal. Cook the pasta shells in boiling salted water until al dente. Drain the shells, rinse with cold water, and set aside. Heat the olive oil in a large skillet over medium-high heat. Add the onion; sauté for 2-3 minutes until translucent. Add the garlic and sauté for another minute. Add the sausage; use a wooden spoon to break it up into small pieces. Season the mixture with salt and pepper. Cook the sausage for 5-6 minutes until it starts to brown. Stir in the chopped spinach; continue cooking the mixture until the spinach is wilted. Remove the skillet from the heat; set aside to cool for 10 minutes. Stir in 1/2 cup of the tomato sauce and the ricotta cheese. Use a spoon to fill the pasta shells with the sausage filling. Spread 1 cup of tomato sauce in the bottom of a (12-inch round or 9-inch square) baking dish. Arrange the filled shells in one layer in the baking dish. 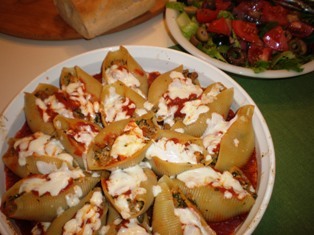 Top each of the shells with a teaspoon of tomato sauce and a portion of the mozzarella. Cover and bake for 20 minutes. Remove the cover; bake for another 10 minutes or until lightly browned and bubbly.